An account of tunneling work undertaken in Whitby during 1963 and 1964, kindly submit to Whitby Online by Bill Headdon, 2009. UNDER THE SLIPWAY AT WHITBY. For Ken, Jim and Brian, et al. I had always been fascinated by Whitby and its history, even before our tunnel works in the Winter of 63/64; later, I sometimes dreamt of being there, but the details were opaque and obscured, and the past seemed locked in my memory. Then, in May of this year (2009) I did return, the sole survivor now of a team of tunnel miners and engineers who had burrowed under the old Lifeboat slipway, which had been constructed in 1915 to house the Motorised Lifeboat. The previous station had been associated with the legendary Coxswain Thomas Langland, who retired in 1920 after almost 50 years of service and had held both RNLI Gold and Silver Medals, during which time his crew had saved over 200 lives. * I was privileged to be shown the new lifeboat station by a crew member, and I saw how the site had changed from the almost Spartan utility it had been in 1963 into a purpose built HQ, complete with crew's quarters and much larger than before. I saw the cut-off piles of our cofferdam beneath it and adjacent to the jetty from which we had worked some forty five years before. It was then that some features of our work and our stay there became clearer. Once again, the rampant Beetles' records, Gerry and The Pacemakers and The Rolling Stones ghosted their strains in the knocked-down caf� where we took our breaks; I saw The Prince of Wales pub where we drank; and heard the to and fro of fishing boats laden with cod and haddock; the bawling Fish Market. Author - on jetty outside of the lifeboat station. The workings are behind the motorcycle and beneath the station. Our base had been the jetty adjoining the old Market Square and The Shambles, when, in December 1963 and January 64 we had driven our small-bore pipes (36" inside diameter) under the lifeboat slipway as part of a main drainage scheme for Whitby. The specialised technique was necessary so that the lifeboat could be launched and recovered without interruption: our firm, William F. Rees of Old Woking in Surrey, was a pioneer of this type of tunnelling in this country, which originated in Sweden. The work entailed jacking spun reinforced concrete pipes by means of hydraulic power through the subsoil of the foreshore. We worked from a purpose-built coffer dam of Larsen piles, with a specially constructed concrete "wall" at the rear, against which was placed a steel thrust plate that took the full force from the hydraulic rams. Soil was excavated from the face by the miner and conveyed back to the "thrust pit" by skips drawn by hand. The pipes, about five tons in weight, were lowered by means of a crane, which also brought the skips of spoil up to the surface. Previous surveying had determined the line and level of our tunnel, which inched its way towards another coffer dam, called the "reception pit"; once it had reached the reception pit, a hole was cut in the steel piles and the tunnel was then jacked forwards until the steel "shield" could be recovered. The shield enable the miner to excavate in some safety and was equipped with a bevelled leading edge which helped ease the forward movement; it was also equipped with a small level and four screw jacks for correcting the tunnel's line and level, which was checked periodically from the thrust pit with a dumpy level and small staff. We also used a candle at the face, viewed through plumb lines suspended in the pit; a method which was surprisingly accurate. As I remember it now, the work was not especially arduous, the sub-soil being fairly easy to excavate, though water seepage was a problem and we used large pumps to keep the level down in the thrust pit. Because we only tunnelled a short distance (some forty yards?) and the mainly alluvial deposit gave little resistance, the hydraulic pumping pressures were well within capacity. 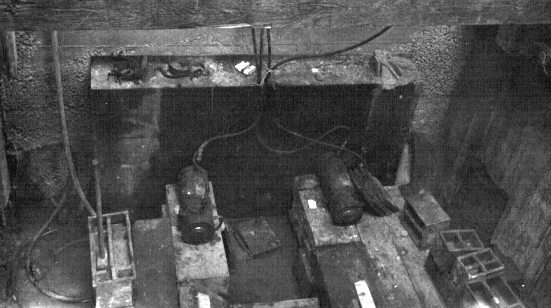 A typical thrust pit setup; note the rams and steel thrust plate against the concrete wall. Also the spacers. That, then, was the main technical side of things, but there were other considerations which had to be addressed. Because of the rise and fall of tides it was necessary (for engineering and safety reasons) to work mainly at low tide, or a couple of hours either side of the neap. It seemed fitting, given the literary history of Whitby, that we often worked when it was dark and slept when it was light; I am sure Bram Stoker (and even Count Dracula) would have approved of our work schedule! Indeed, one day when we couldn't work for some reason, I recall a visit up the steps to The Abbey and (intriguing) Parish Church, where one was struck by the coincidence of Ecclesiastical history with Gothic myth and romanticism. The ghosts of Mary Wollstonecraft Shelley and Bram Stoker seemed manifest alongside the graves of local souls; one also felt the ever-present influence of the port's greatest "son", Captain James Cook. Fittingly, our "digs" were in a house almost directly below the steps up to the famous cliff top; I recall our landlady was a kindly Yorkshire widow, whose husband had been a policeman in York. She was a superb cook, and introduced us to real Yorkshire Pudding, served as a dish before the main meal; though sadly her name escapes me I do remember her dog was a black Labrador called Prince ("Prinny"). I had been born and raised in a Cornish port, and the street in which I lived was famous for its old sea Captains and hands. Indeed one, Archie Jewell, had been a survivor of The Titanic disaster; he was employed as a lookout and had been on duty previous to the watch that saw the Iceberg strike. We too had our lifeboat; and a friend is still President of the local RNLI, and has been honoured with medals. My reason for this digression is that I had a great feeling of empathy then, and still have, with those courageous Whitby men who went down and did their business in great waters. A finished tunnel. 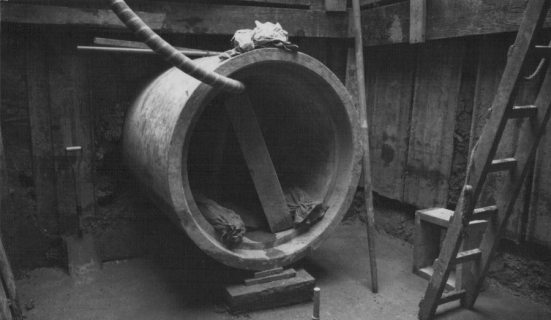 3' diameter pipe, thrust into the reception pit. On the last night of my stay I looked down from the hotel bedroom on the same blackened face of the waters streaked with light. The same tide lapped at the old Fish Quay and around the piles of the Lifeboat Station. The statue of Captain Cook gazed across the chasm towards the indeterminate hulks of the Abbey and squat church of St Mary's, and I imagined the great silence of years about to be broken by a choir's sonorous, "Eternal Father, strong to save..". And the old fishing Port waking, startled by this rattle of memory. Bill Headdon, Tunbridge Wells, May 2009. 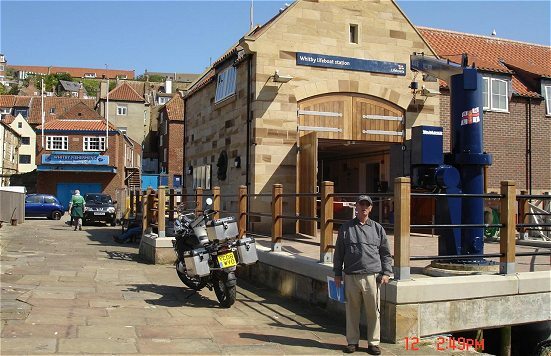 The Whitby Lifeboat Station; The Whitby Gazette. Abraham Stoker, 1847-1912, author of "Dracula". Born Dublin. Mary Wollstonecraft Shelley, (nee Godwin) author of Frankenstein 1818. Captain James Cook, 1728-79. Born, Marton, Cleveland, Yorkshire. Navigator and Explorer. Notes: "dumpy level", small type of Theodolite.